VeloPress is pleased to announce the publication of a beautiful new book about cycling's spring classics. In time for the holidays, The Spring Classics: Cycling's Greatest One-Day Races is now available in bookstores, bike shops, and online. With insightful text from L'Équipe's top writers and hundreds of rare and newly restored photographs, The Spring Classics delves deeply into the rich stories of cycling's most glorious and meaningful history. 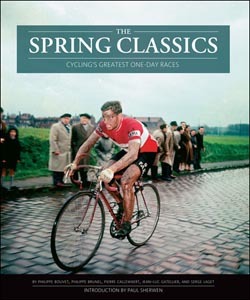 Readers are invited to preview The Spring Classics at velopress.com. For many who love cycling, the spring classics are the most anticipated races of the year, not only because they herald the start of the season, but also because they are brutally difficult and spectacularly unpredictable. These one-day races test cycling's toughest riders with the worst conditions imaginable-sucking mud, choking dust, leg-numbing sleet, and Europe's narrowest, most bone-grinding roads. Clattering through agrarian hamlets on roughly paved routes carved from the hills more than a century ago, the spring classics embody the soul of the sport of cycling. The Spring Classics enshrines races such as Italy's season-opening Milan-San Remo, which winds south toward the lumpy Ligurian coast on its way to a furious finish; Ghent-Wevelgem, Belgium's test for sprinters, always won with a burst of lightning; the tooth-rattling Tour of Flanders, with its interminable stretches of treacherous cobblestones; and, of course, Liège-Bastogne-Liège, a monster created in 1892 whose tempestuous weather and sawtooth profile made it the dark prototype for every tough race that has followed. In its encyclopedic embrace of Europe's greatest one-day events, The Spring Classics also celebrates the essential races that round out the cycling year: Paris-Tours, which moved from spring to fall in 1951; the Clásica San Sebastián, which burst onto the Basque cycling calendar in 1981 and is now enshrined as August's most important contest; and the Tour of Lombardy, "the race of the falling leaves" along the shores of Lake Como that closes the calendar in October with elegance and style. Taken together, these are the races that truly define a year in cycling. It is from these ultimate challenges that heroes are born, legends are made, history is written, and the eternal struggle to triumph over all odds is fought, won, lost, and celebrated. The Spring Classics offers wonderful photographs and stories of Liège-Bastogne-Liège, La Flèche Wallonne, Paris-Roubaix, the Tour of Flanders, Het Volk, Ghent-Wevelgem, Milan-San Remo, the Amstel Gold Race and of the Grand Prix of Frankfurt, Clásica San Sebastián, the Championship of Zurich, Bordeaux-Paris, Paris-Tours, Paris-Brussels, and the Tour of Lombardy. Hardcover with jacket. Full-color and b&w photographs throughout. VeloPress is an endurance sports and fitness publisher with books on cycling, triathlon, running, nutrition and diet, yoga, and the histories and personalities of our sports.